Indian KDE Community is organizing its maiden conference - conf.kde.in in Bangalore on 9th, 10th and 11th March followed by a two day code sprint on 12th and 13th. KDE-India is a group of volunteers meeting up at various FOSS events in India and abroad. Over the last few years, there has been a substantial increase in contributions to KDE from India to various avenues like coding, localization, marketing, website/infrastructure maintenance etc. There has also been a lot of contributions as a part of programmes like Google Summer of Code and Season of KDE. 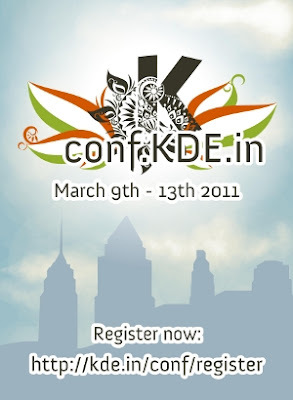 Now Indian KDE volunteers have come together to organize a conference solely dedicated to KDE and Qt with an aim to spread KDE far and wide within India and to have new aspiring contributors to KDE. Visit Official Site for Registration, Venue, Accommodation info and further details.